This year's event broke records in registrations, at over 720, sponsors, press attendance and innovations. We look forward to seeing you in 2010! 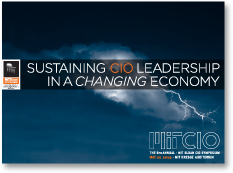 Sustaining CIO Leadership in a Changing Economy As CIO and as a senior business executive, you embrace a technology vision to enable improved global business performance for your company. With pressure to do more with fewer resources mounting every year, your success increasingly requires tapping into innovative technologies and new ideas to get the job done. What sparks these ideas? How do you keep up with leading innovations? Find out at the 2009 MIT Sloan CIO Symposium. We thank our sponsors, speakers and attendees of the 2009 MIT Sloan CIO Symposium. The event broke records in registrations, at over 720, sponsors, press attendance and innovations. We look forward to seeing you in 2010! We congratulate the winner of the 2009 CIO Award for Innovation and IT Leadership, Justin Lindsey CTO of Netezza, and our finalists, Frank Modruson, CIO of Accenture, C. Martin Harris, CIO of The Cleveland Clinic, and Jo Hoppe, CIO of Parexel.